The big storm of the past week was the low surface system that came across the Midwest from Sunday to Tuesday. 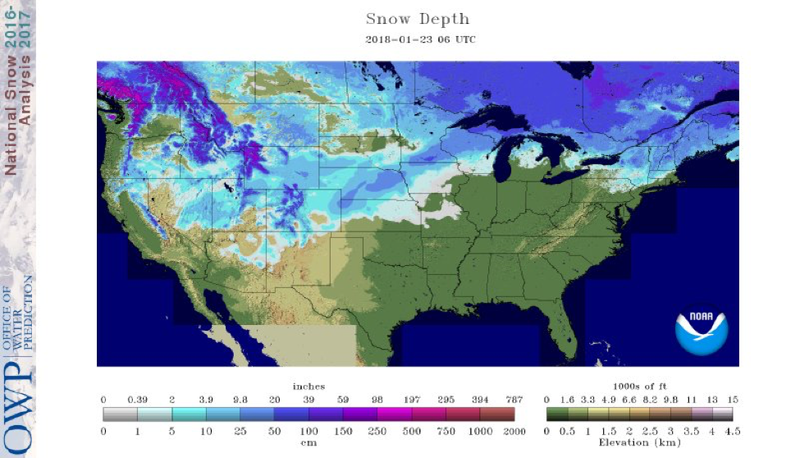 As shown in the modeled snow depth, the storm left a nice band of snow from Nebraska northeast into Wisconsin and the Upper Peninsula. Snow falls were up to 18.5’’. White-out conditions made traveling very difficult and many schools were forced to close. Fortunately, it dumped over a foot of snow, which was great for the riding conditions. As the weather settles down, hopefully you are able to get out enjoy the fresh snow. While the same system moved into the Northeast on Monday and Tuesday, they unfortunately received more rain. This has increased the problem with the snow. Southern Michigan suffered from this warm up and now has very little snow cover if any at all. 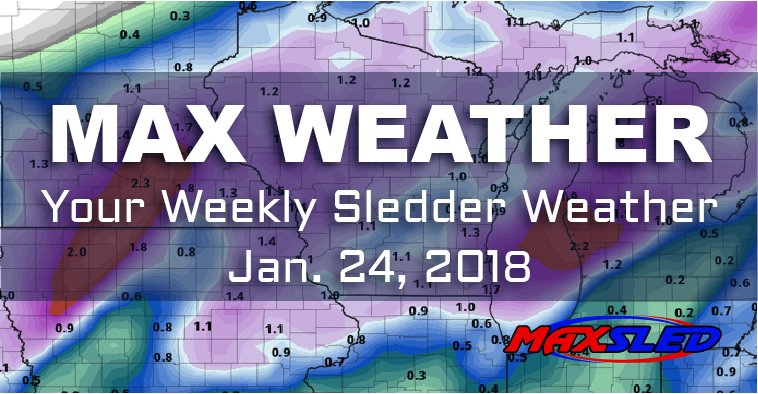 The band of fresh snow through the Midwest will allow for good trail conditions during the week. Wyoming also received snow and the trails have a good snow base. There was rain for the Northeast the last couple of days which will make for icy trails and/or have water problems. Make sure to check your local trails before going out. In the West, a cold front will make its way eastward starting on Thursday. 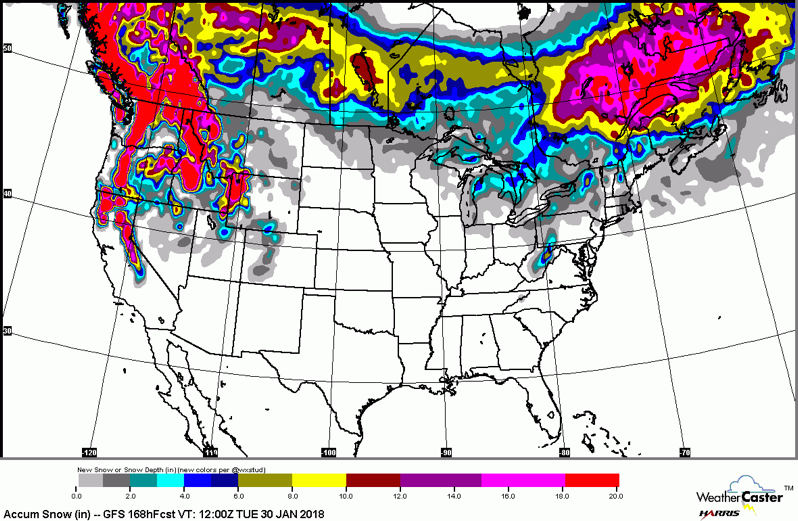 The Rockies should be seeing some snow into Thursday night, while the Midwest will have a slight warm up until the cold front moves in on Saturday/Sunday. In addition, the Northeast will be receiving the warmer temperatures into the weekend and looking at cooler temperatures this coming Monday. Be aware, trails will get pretty slushy and wet during the afternoon with the warmer temperatures. Moisture from the Gulf will move into the Northeast on Sunday/Monday. Optimistically, in New England the cold front will come just in time to have snow on Monday. The lake effect will also come to play with cooler temperatures next Monday and Tuesday.